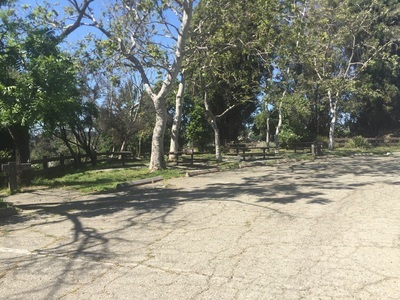 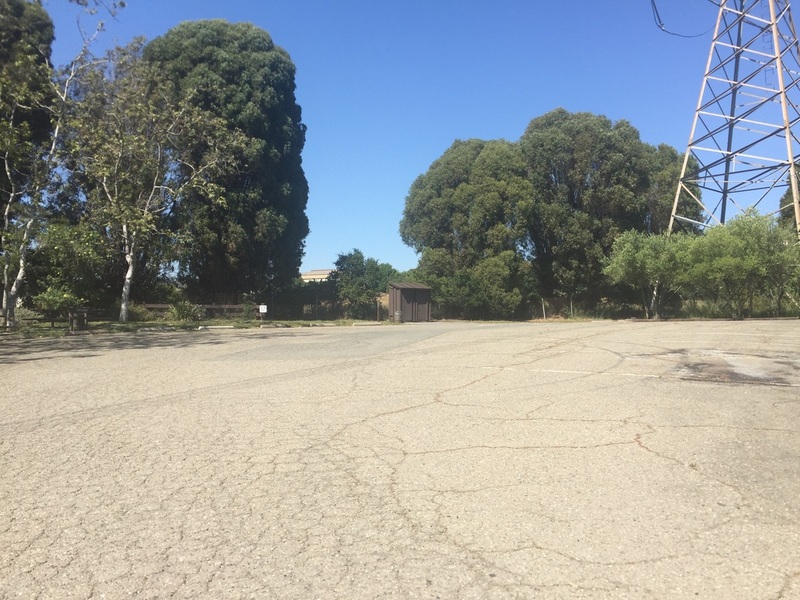 Parking: Large 3-tiered parking lot at the address above. Fee is $5 per vehicle and $2 per dog (weekends and holidays). You can also park in the surrounding neighborhood and it’s only a short walk in (please be respectful of residents). 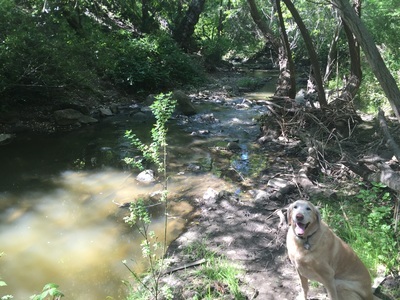 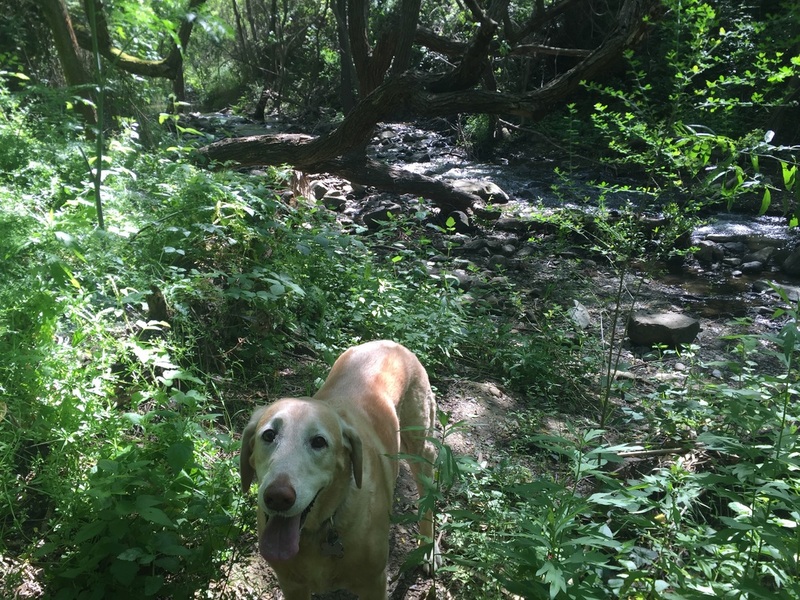 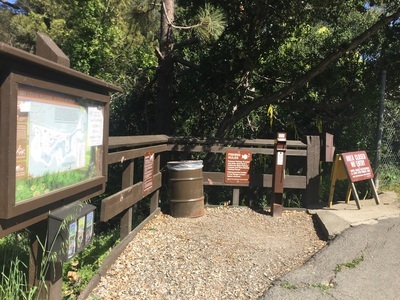 Dog Rules: Dogs must be kept on-leash but you can connect to off-leash trails in the nearby Five Canyons. 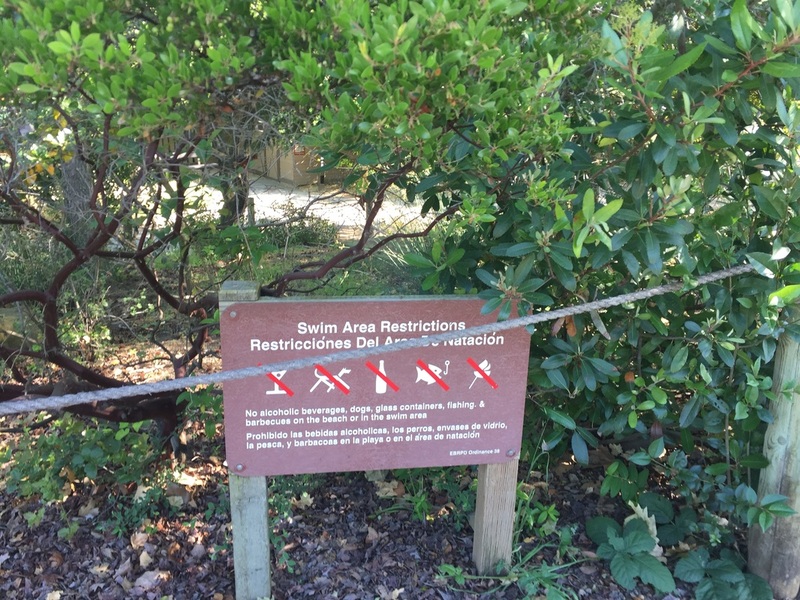 Dogs are not allowed in the Swim Lagoon. Best time to visit: Anytime except a very hot day. 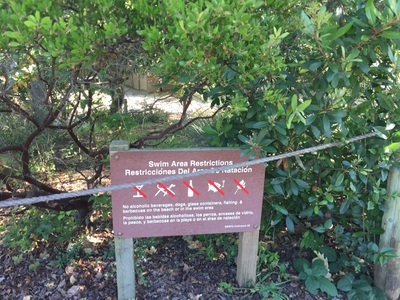 CAUTION: Keep your dog out of the water. 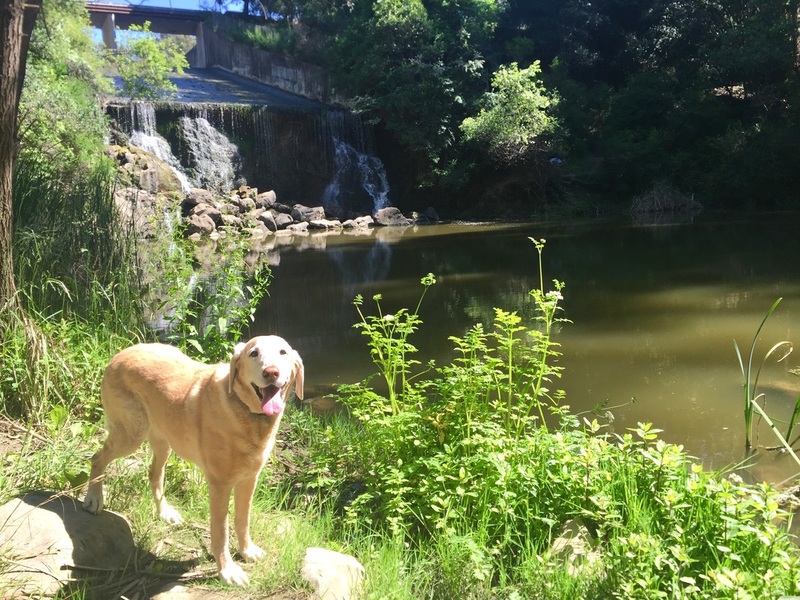 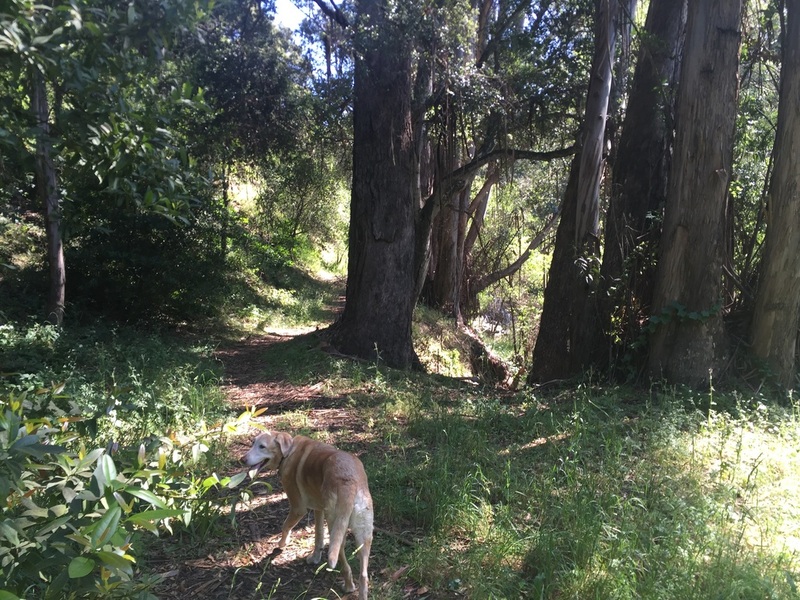 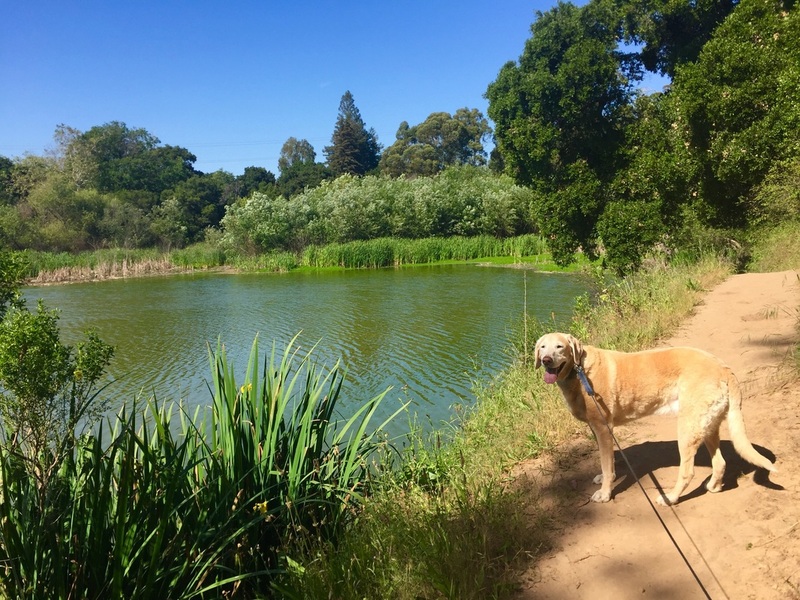 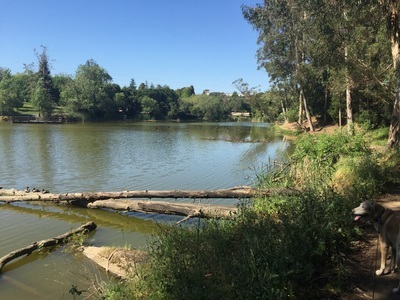 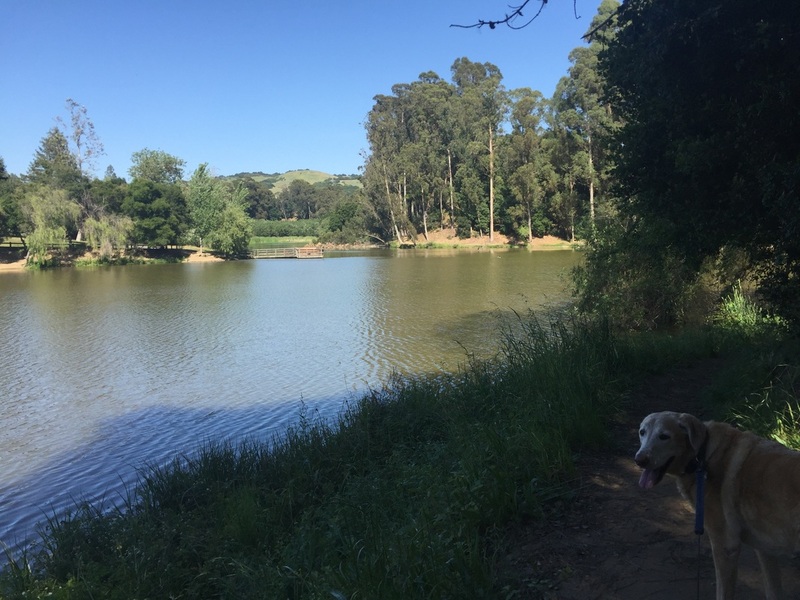 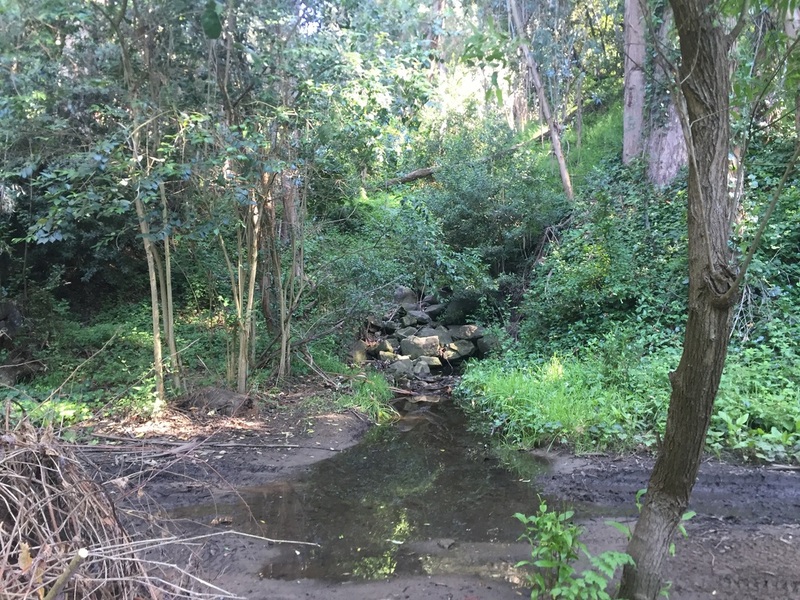 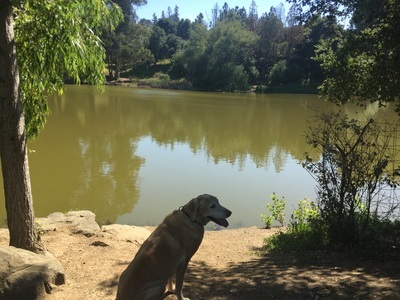 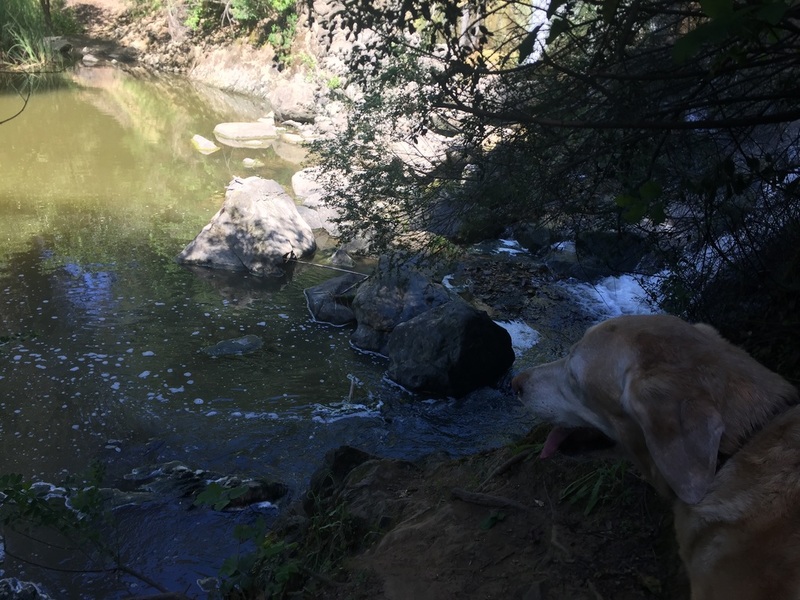 Description: This hike is reminiscent of a combination of Lake Temescal and Lake Chabot. This park is 101 acres and has several miles of hiking trails. The shortest loop of the lake takes you on the Whispering Creek Trail and Ridgetop Trails for a total of about 1.28 miles. 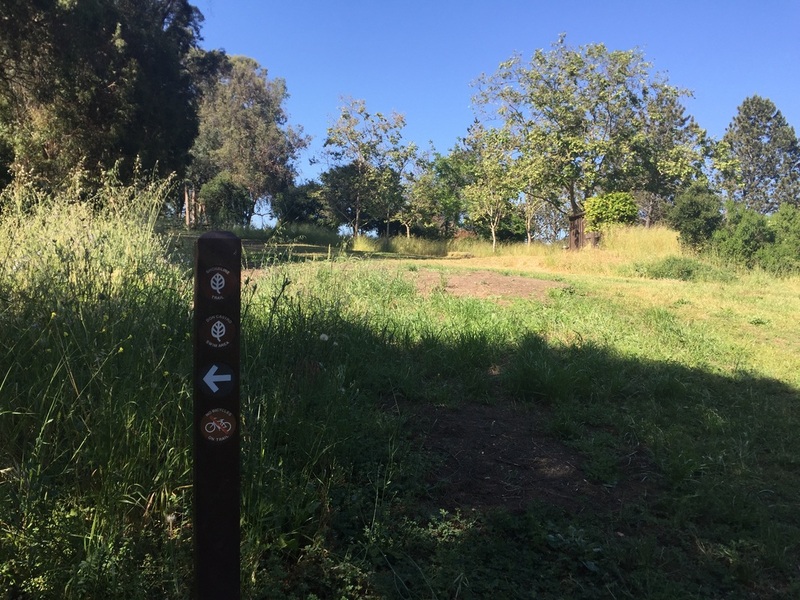 This loop is fairly easy with only a little elevation gain. 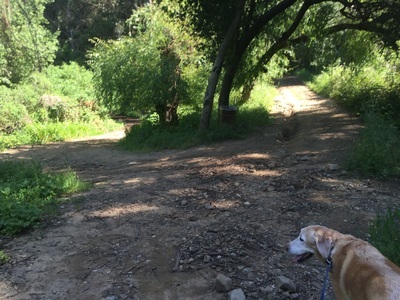 These areas can get very hot under your dog’s paws, so I wouldn’t recommend hiking on a hot day. 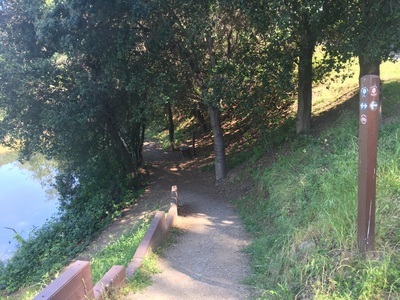 You can add in the Shoreline Trail that hugs the shore of the lake, as well as some side trails for a longer hike. Some of the side trails are just short loops that join the original trail you were on, but there are some steeper side trails if you want more of a challenge. 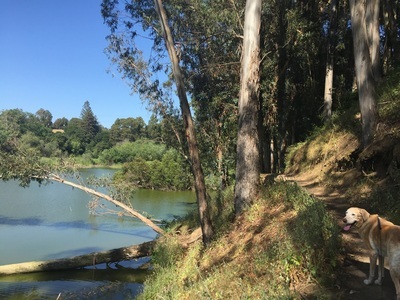 We stuck to the trails hugging the shore (mostly taking the trails to the left when the trails split). 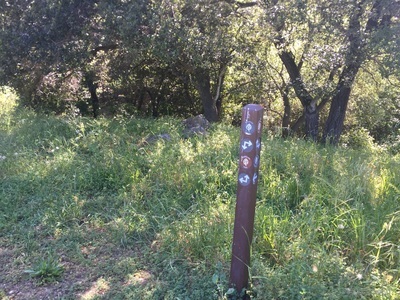 A lot of the loop hike is shaded, but there are a few stretches of dirt trail in direct sunlight. It’s a beautiful hike and you’re likely to see a lot of ducks and geese in the water. 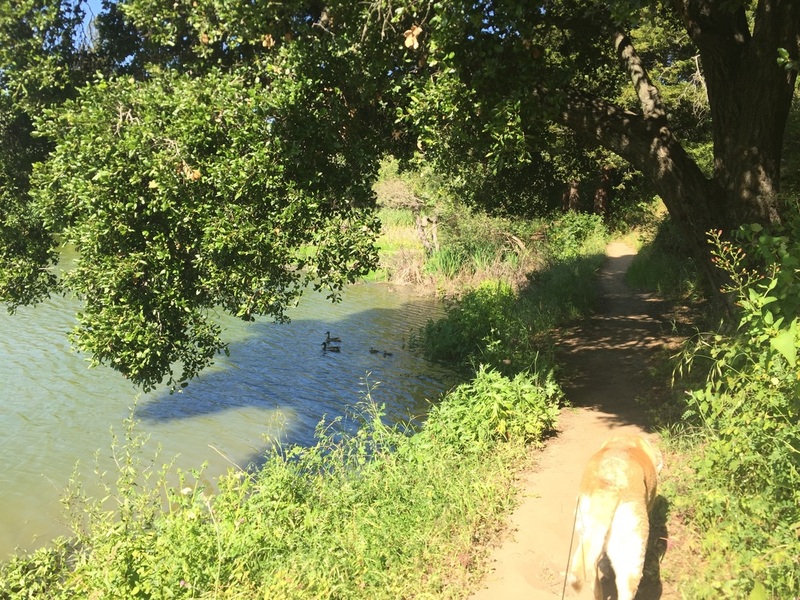 We even saw baby ducks and geese during our hike. 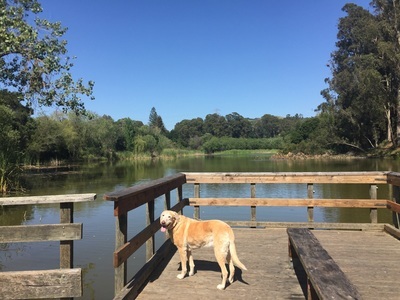 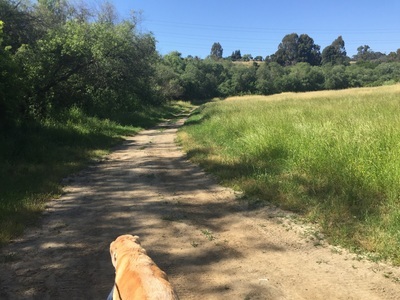 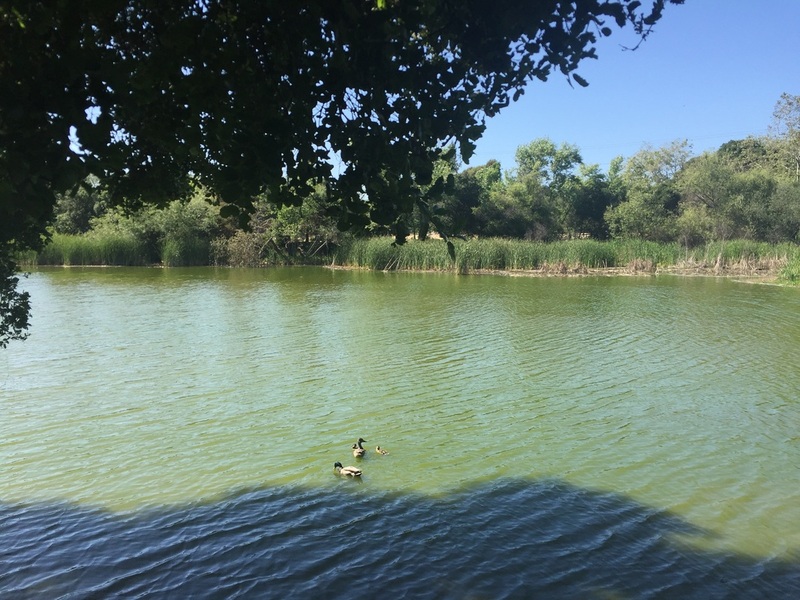 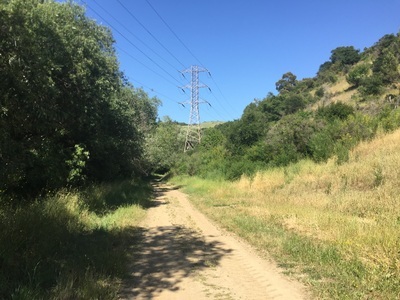 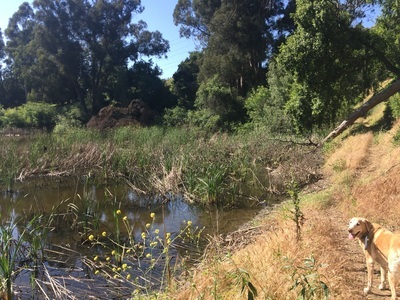 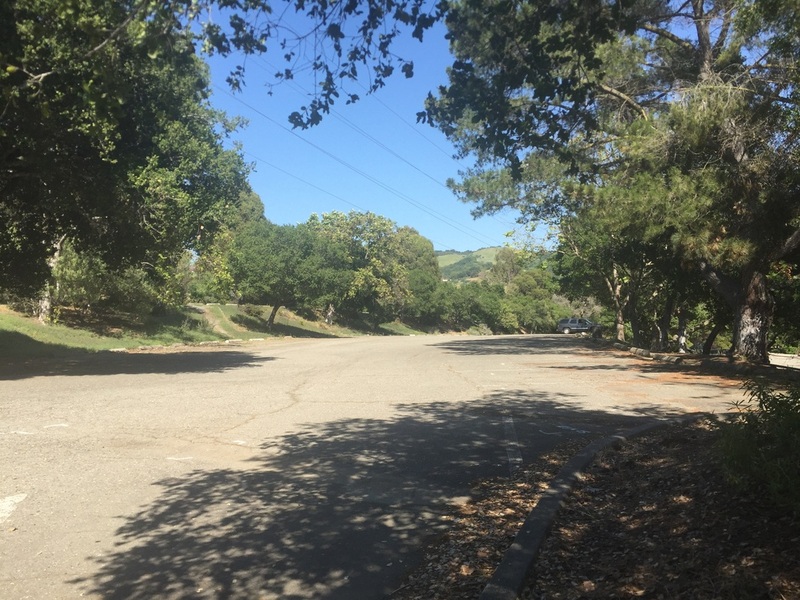 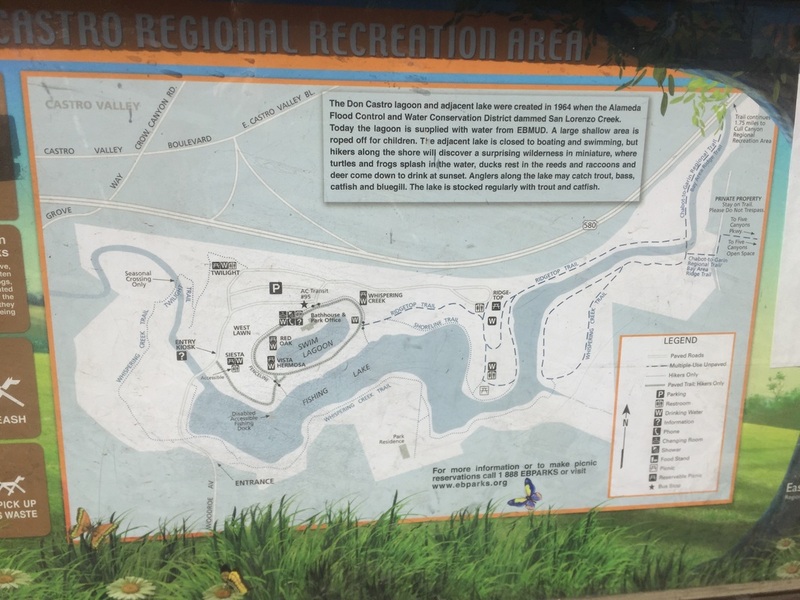 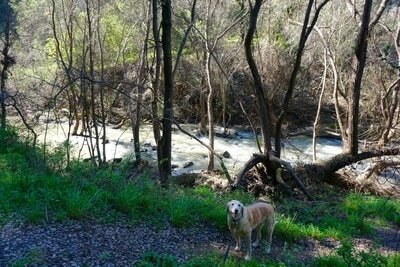 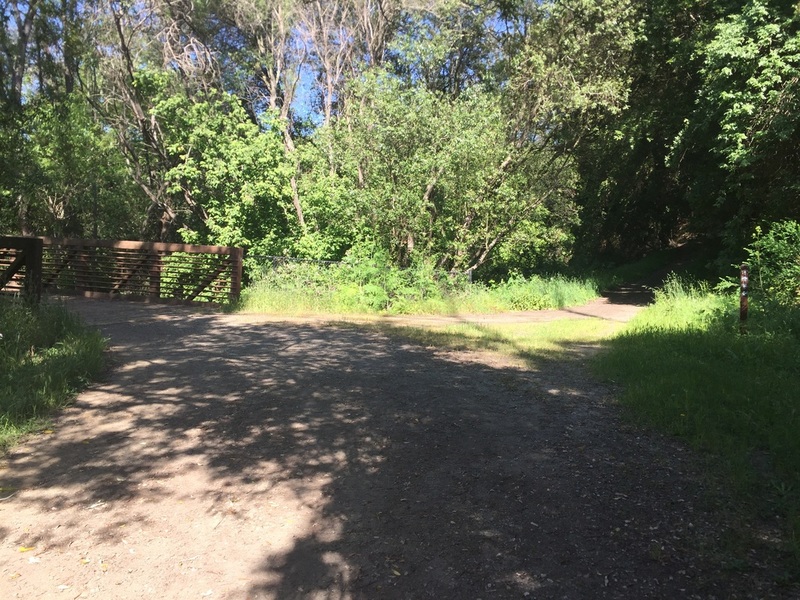 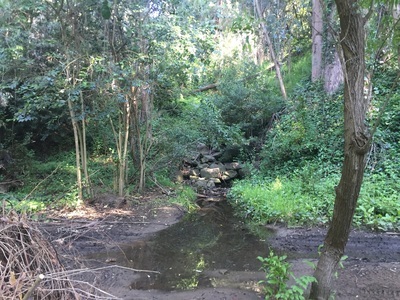 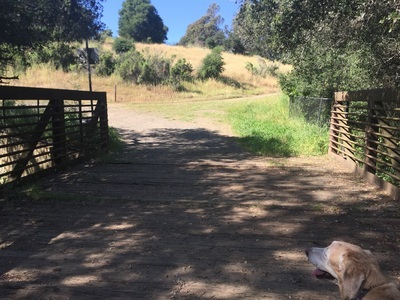 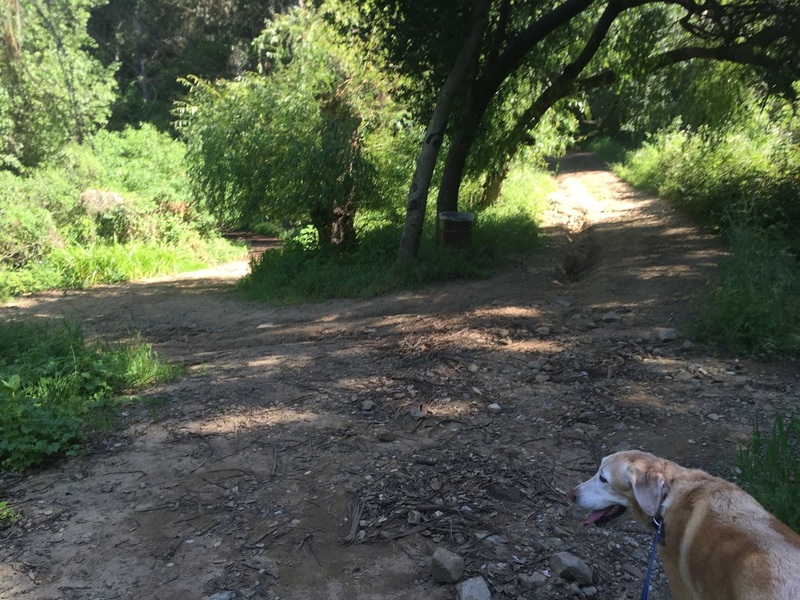 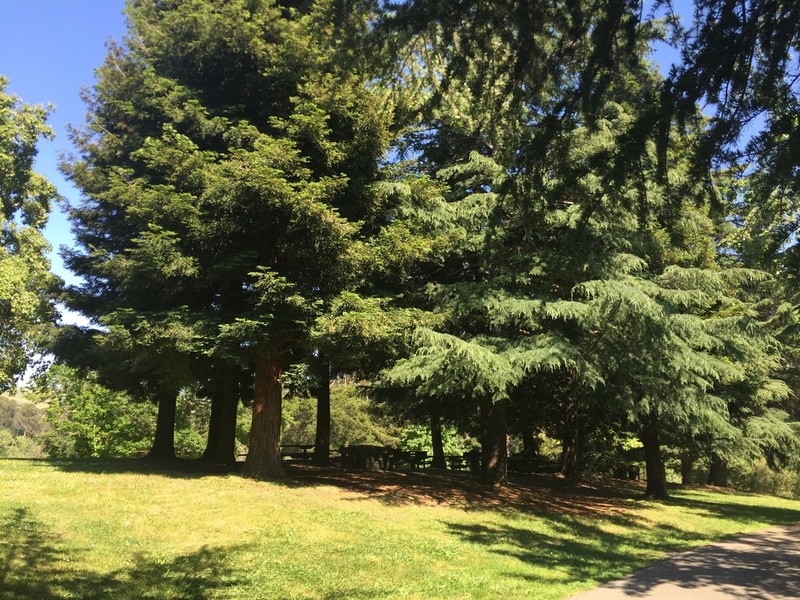 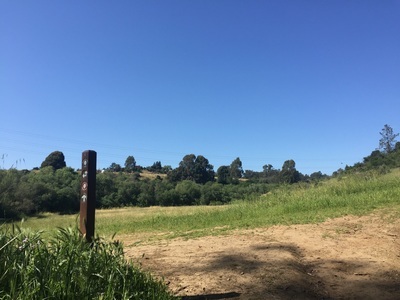 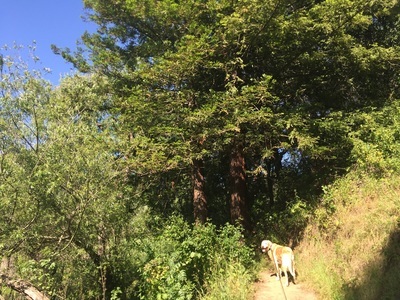 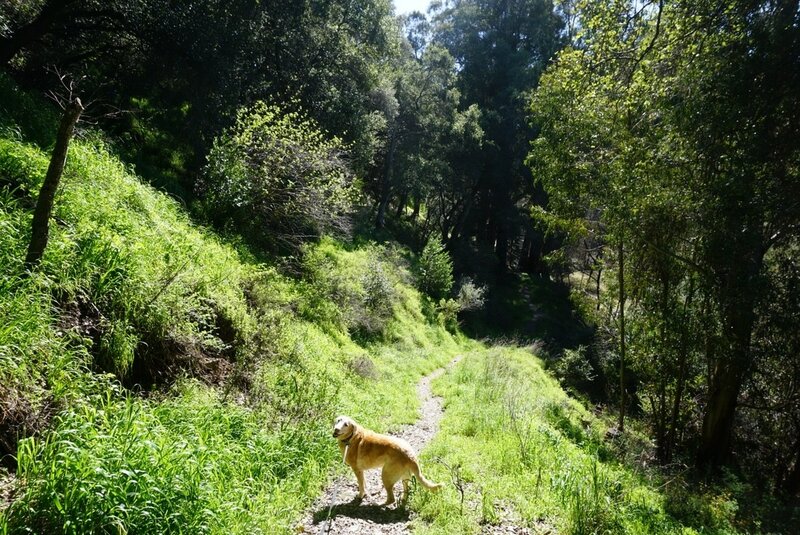 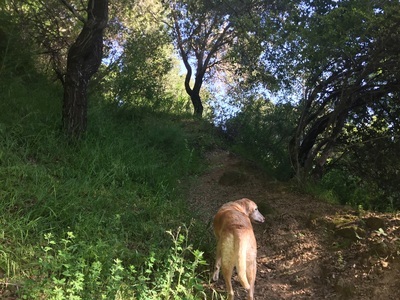 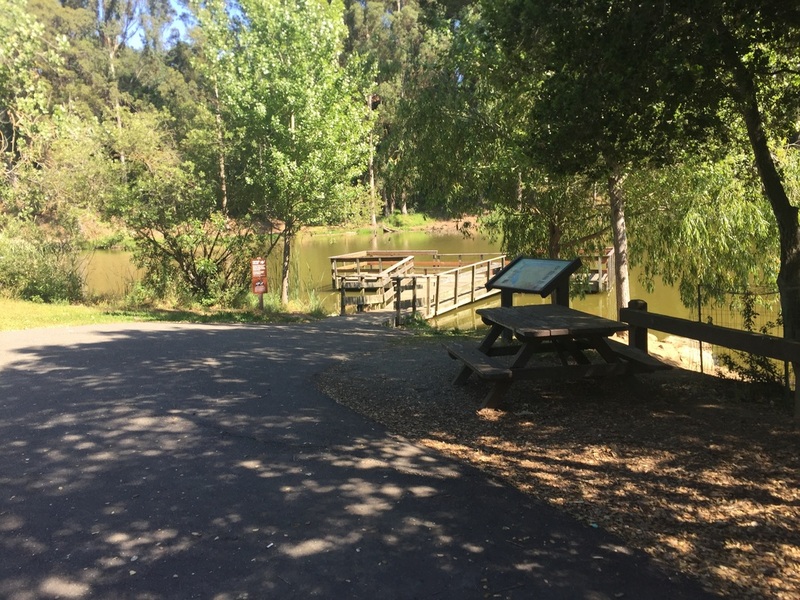 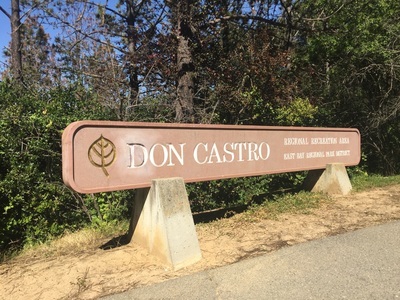 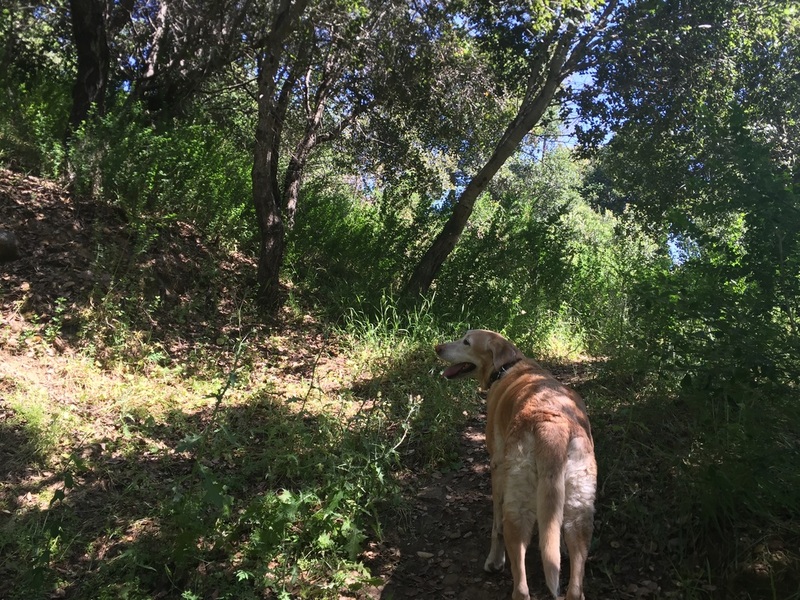 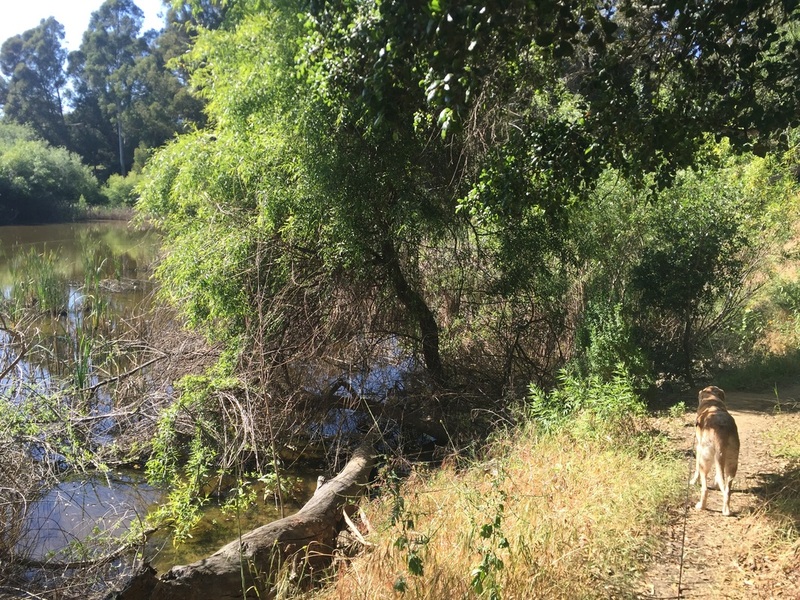 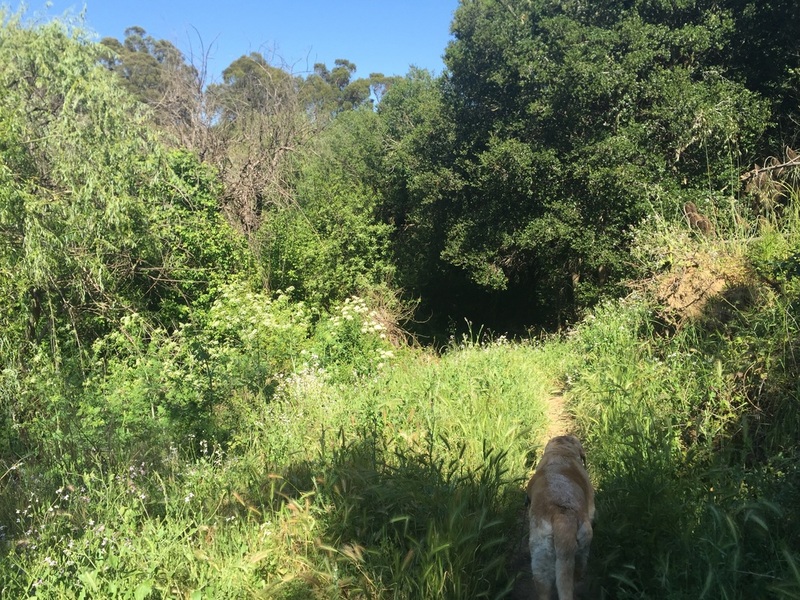 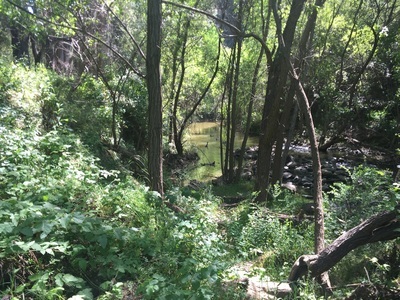 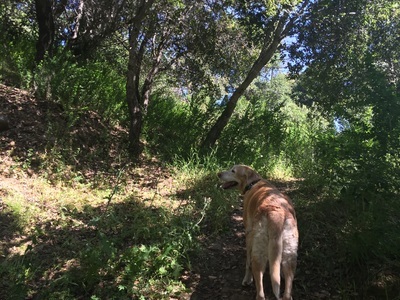 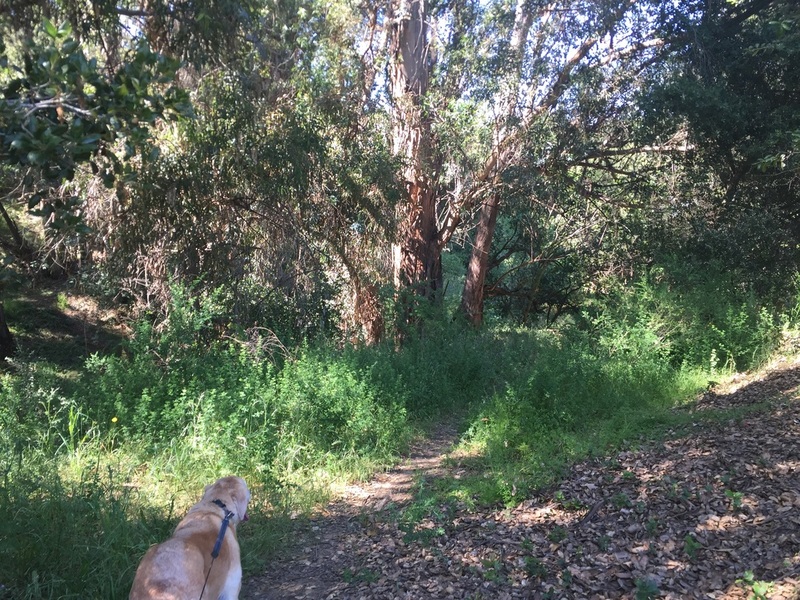 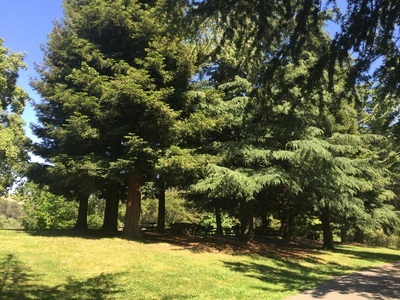 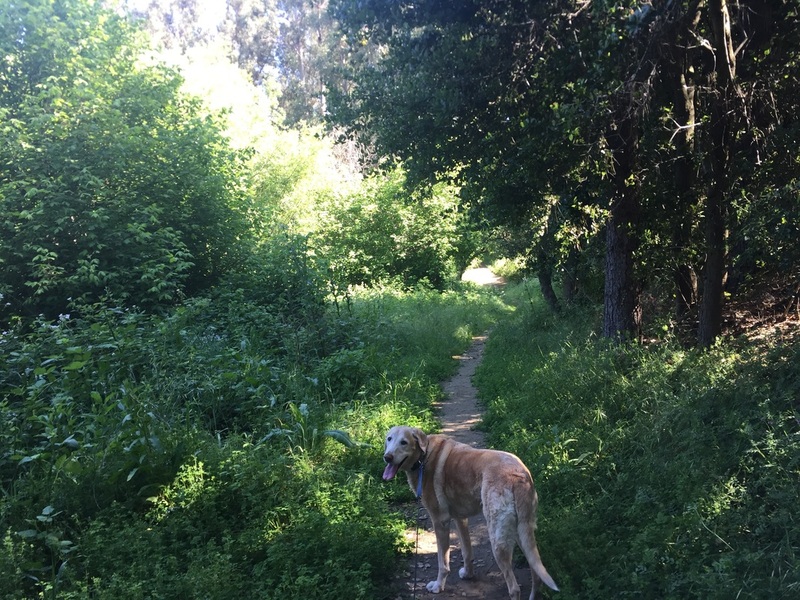 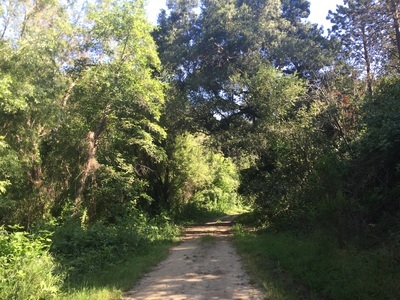 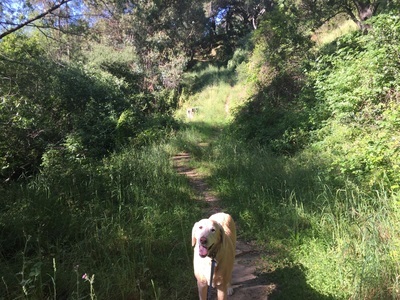 For a longer hike, you can also take the Chabot-to-Garin Regional Trail (right before the bridge on the Whipering Creek Trail), to connect to Five Canyons Open Space Preserve. This trail is steep and a great workout. That park has a lot to offer as well. 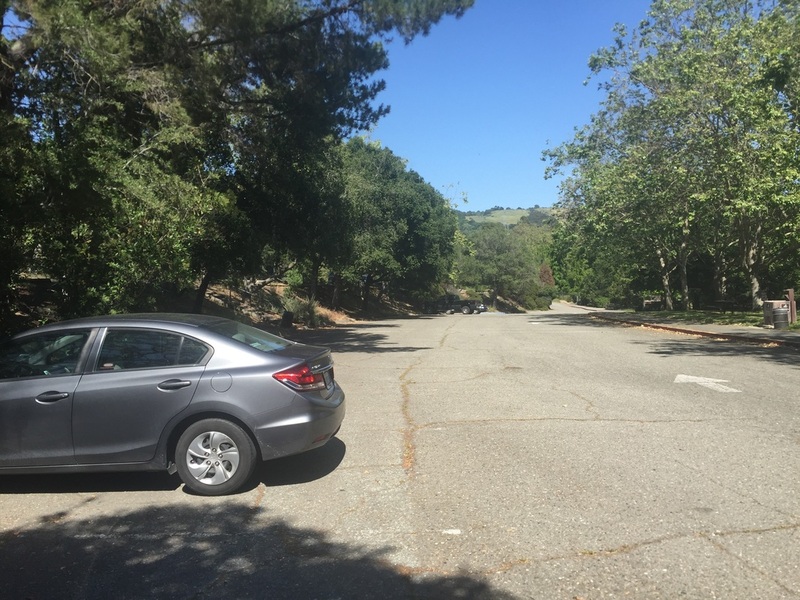 During our hike, we parked at the highest tier of the parking lot and began our hike on the Twilight Trail. 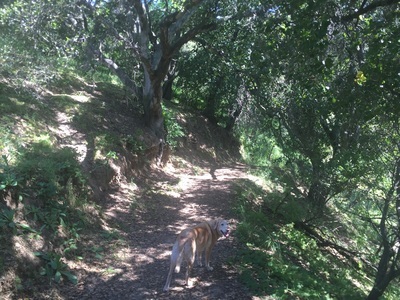 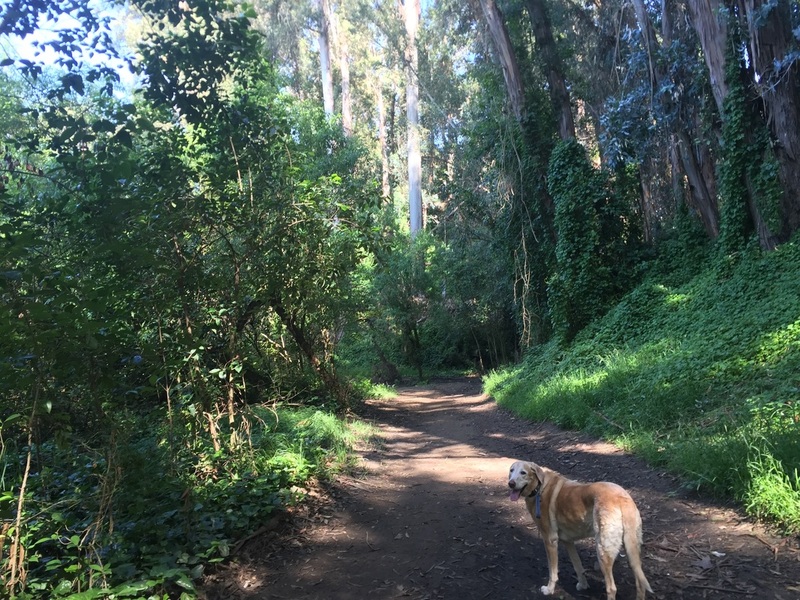 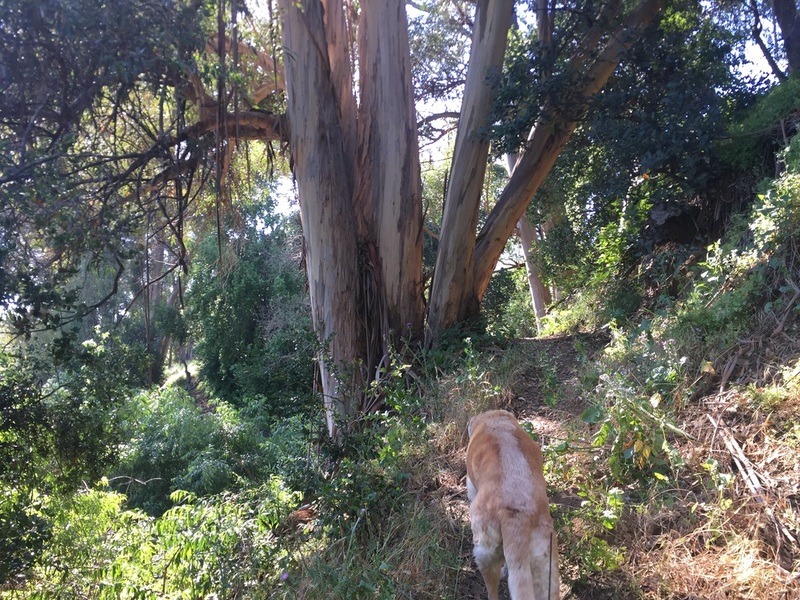 This trail runs along the creek through shady eucalyptus trees. 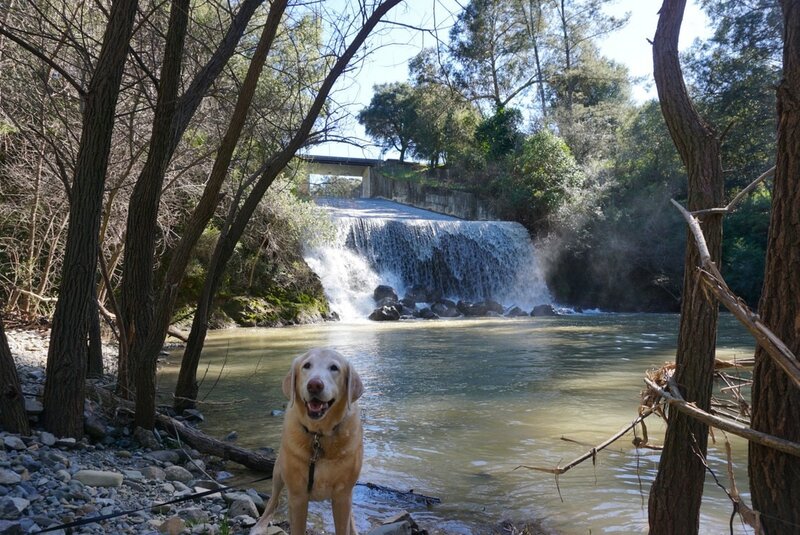 After a short stretch you’ll even see a waterfall! The trail map shows that there is “seasonal crossing only,” and it was quite deep when we visited. 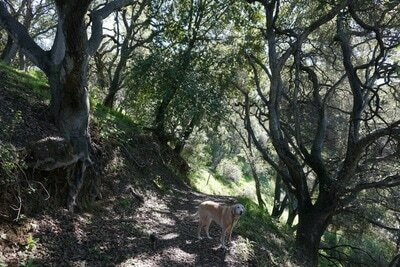 However, there’s a steep trail that runs up the left side of the waterfall and back to the paved road. 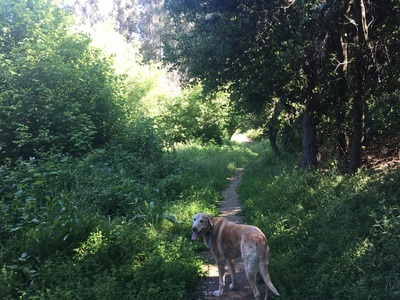 We took this trail and then joined the Whispering Creek Trail to loop the lake. 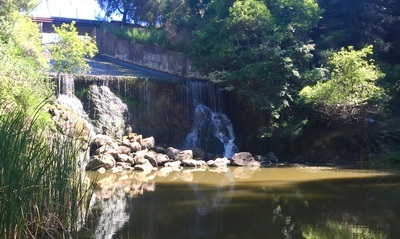 During a visit in early May, even though it hadn’t recently rained, the waterfall was flowing quite well from the lake’s runoff. I suspect that this waterfall dries up during the peak of summer, when you’re able to cross the creek. Another visit in February, following a recent rain was even more breathtaking, as the waterfall was in full force. 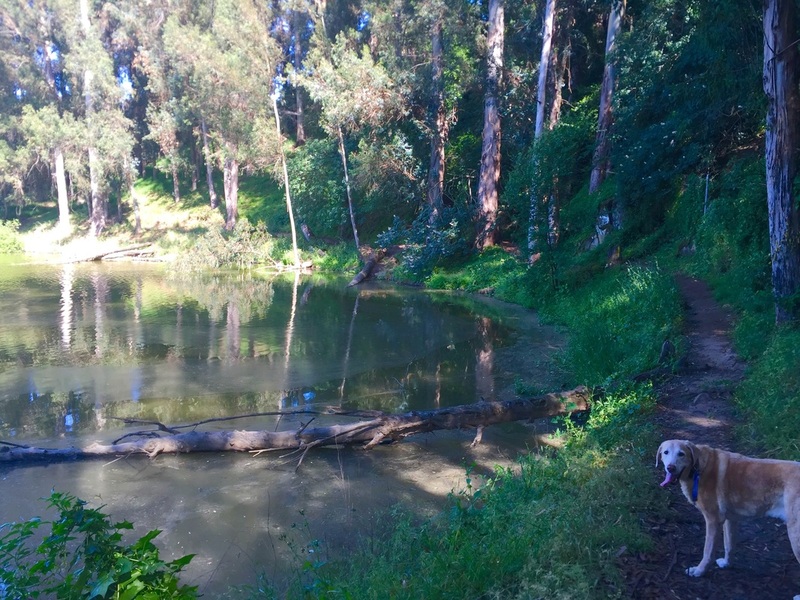 I’ve heard mixed things about whether or not dogs are allowed off-leash here. 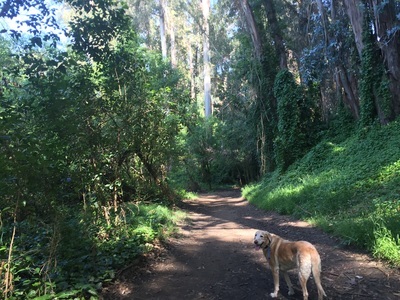 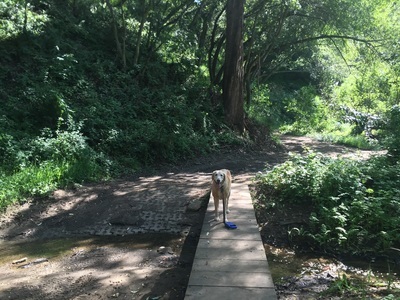 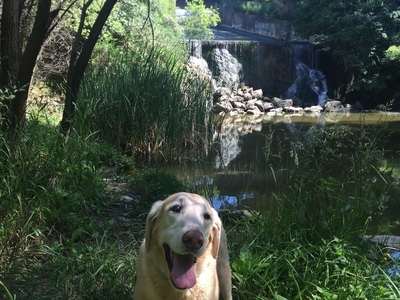 The trail pamphlet has the standard language stating that dogs must be leashed 200 ft from a trail or park entrance, in developed areas and on some trails. 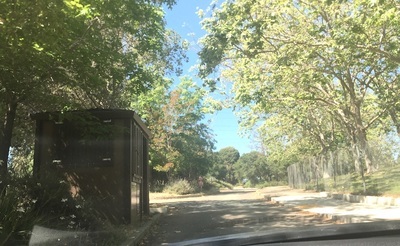 The entrance to the park has a dogs on leash sign, and I’ve heard that park rangers have given tickets to off-leash dogs. Since dogs are not allowed in the water anyway, I would play it safe and keep your dog on leash. 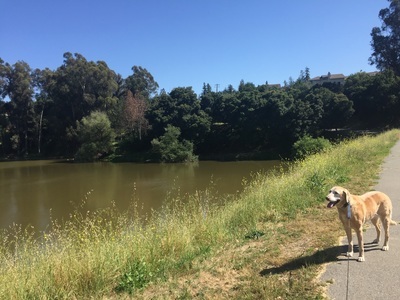 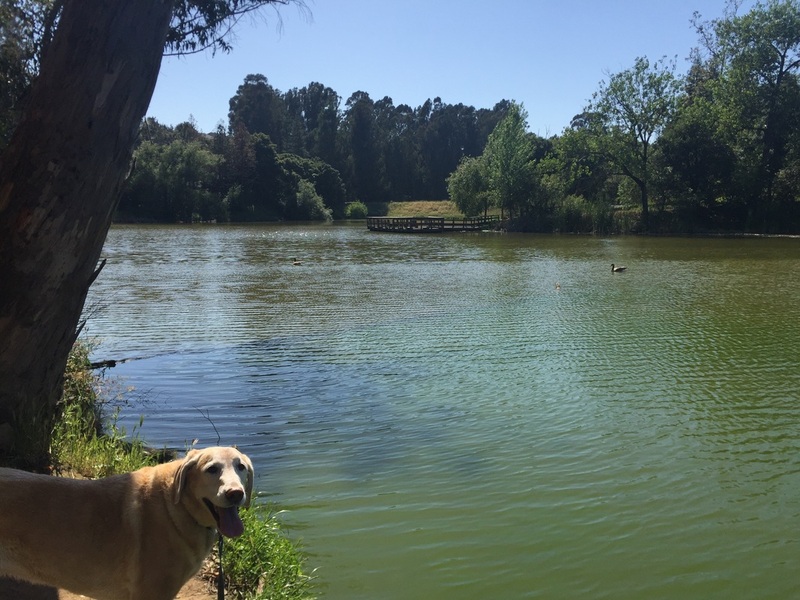 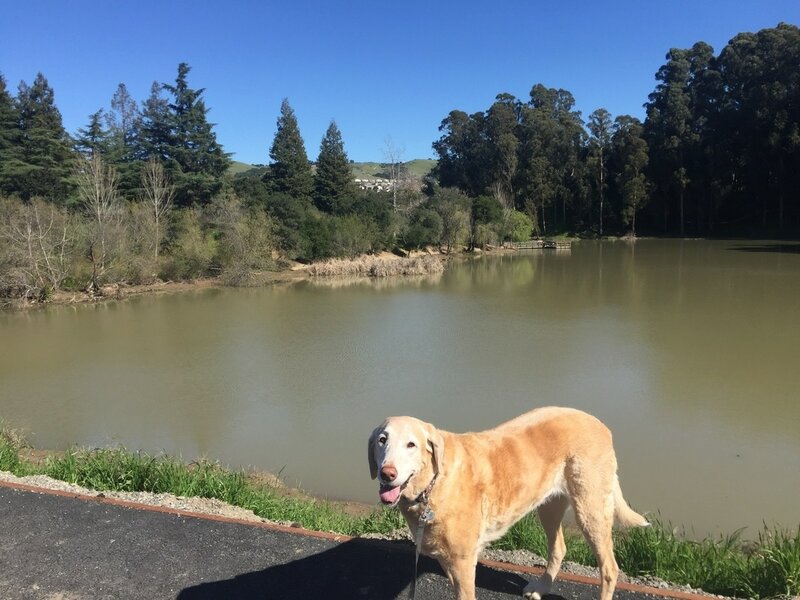 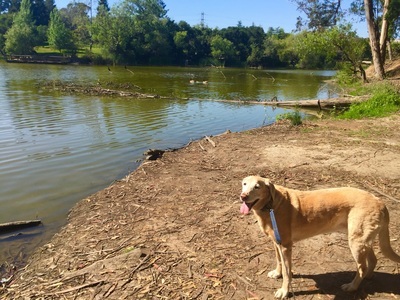 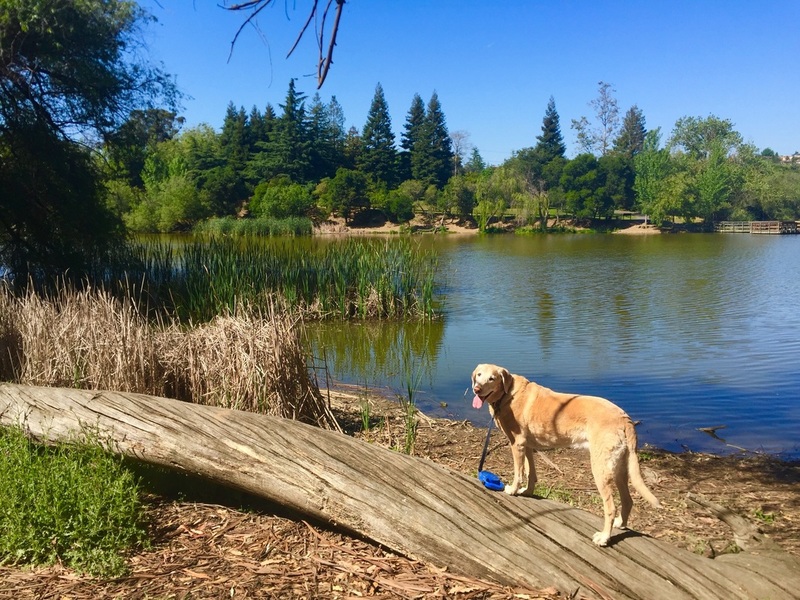 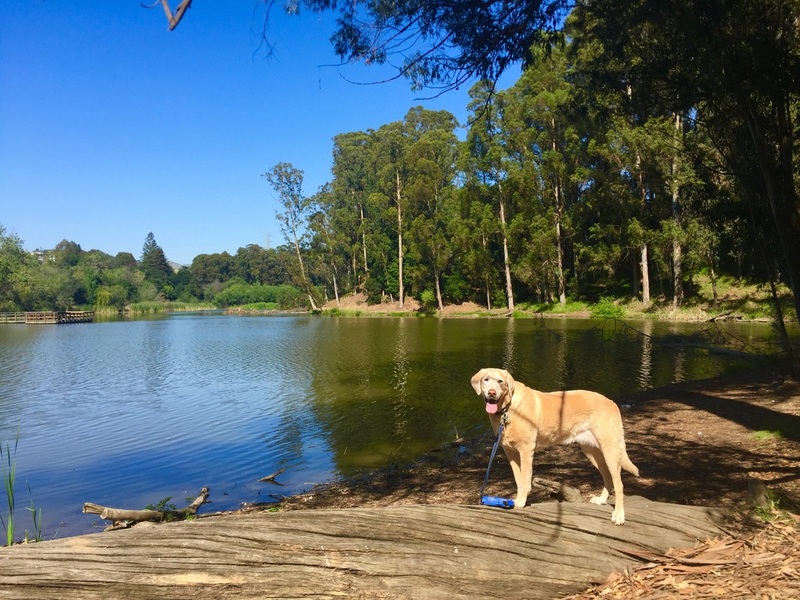 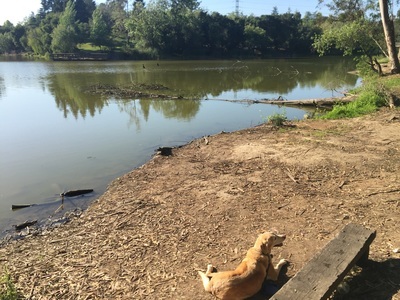 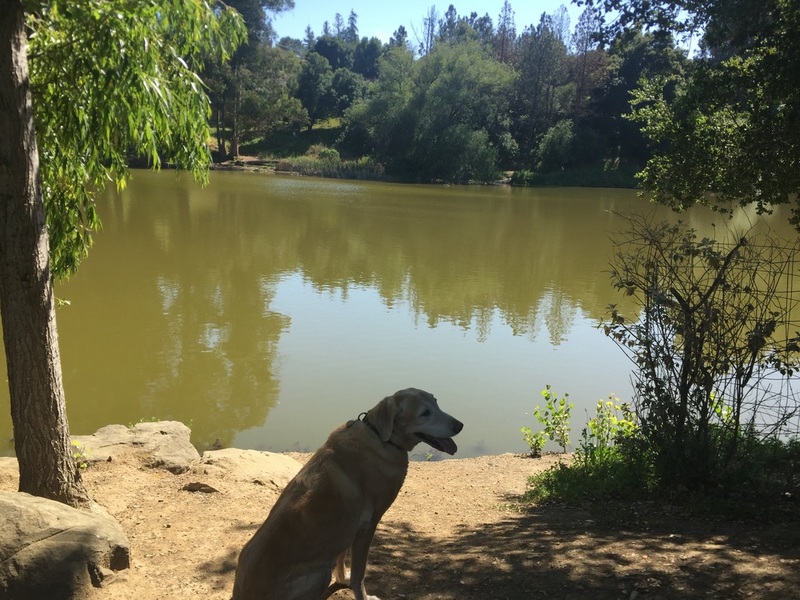 I didn’t see any signs noting that this lake has dangerous algae issues like some of the other bay area lakes, but I did see a lot of scum floating on the top of parts of the lake, so don’t let your dog drink from it. There’s plenty of water faucets available in the park. This park has multiple picnic bench areas, BBQs, pit toilets and water fountains. 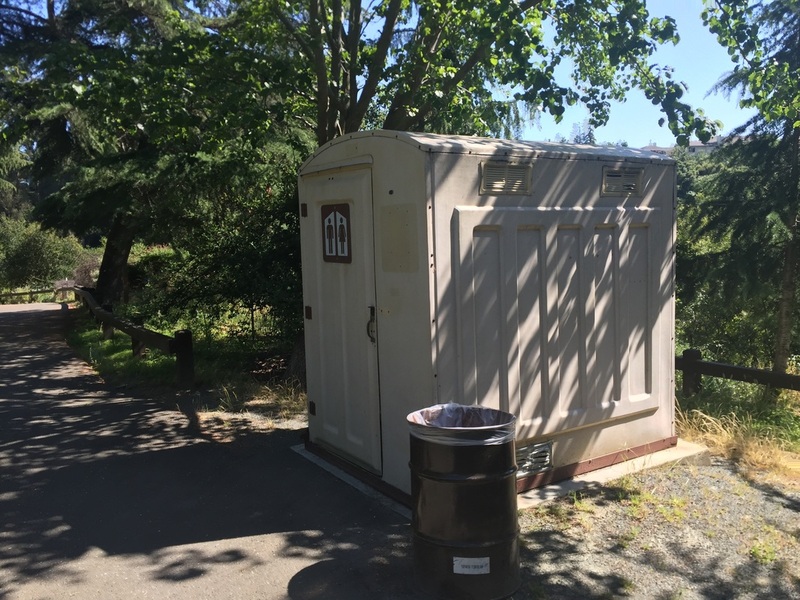 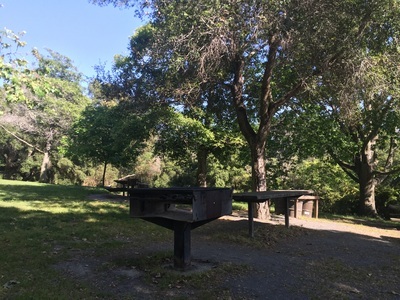 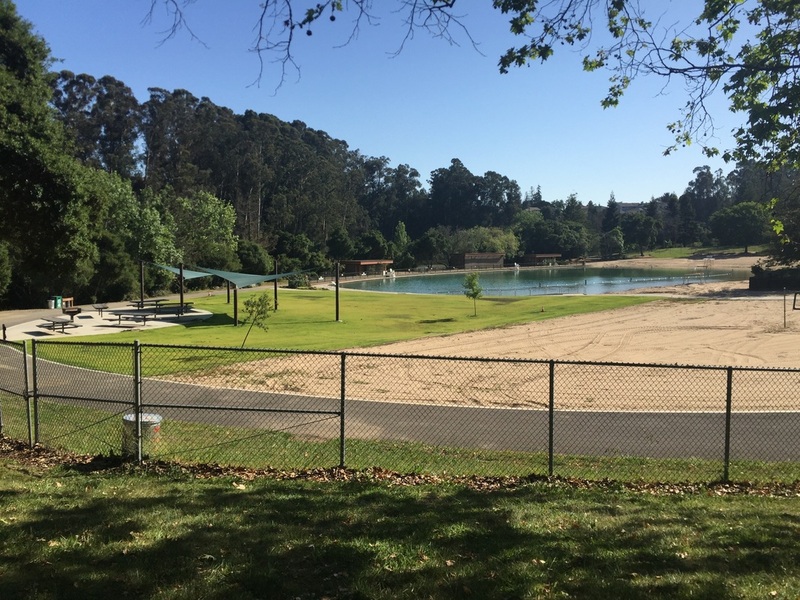 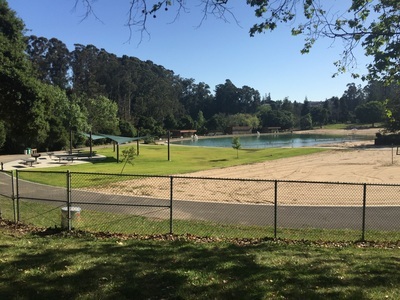 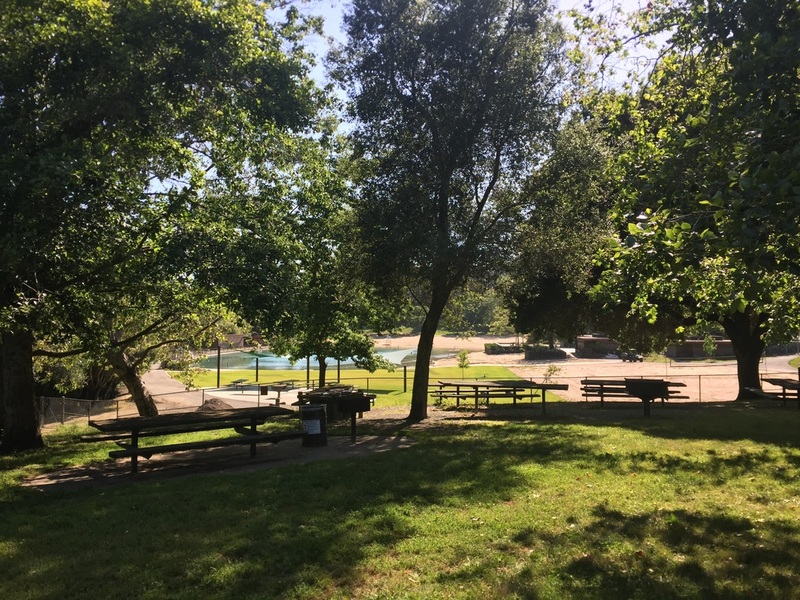 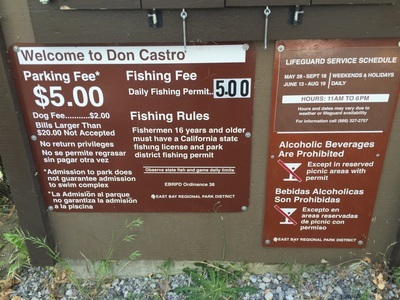 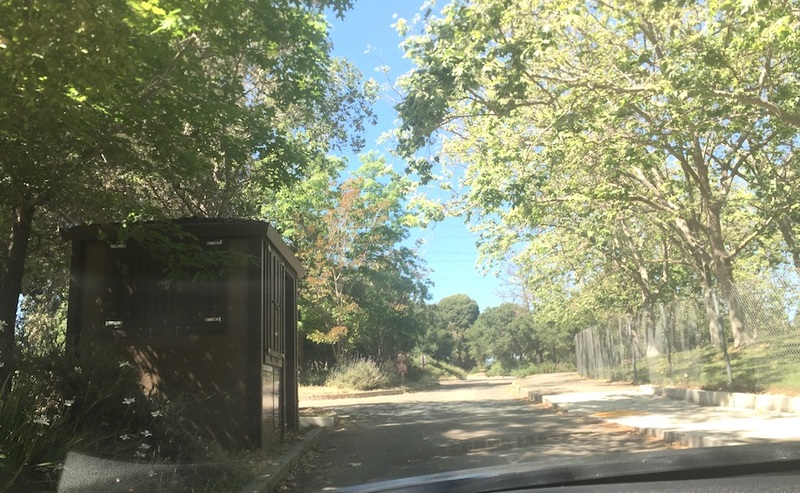 We found pit toilets at the Twilight picnic area (in the upper tier of the parking lot), across from the entry kiosk, and near the picnic areas on the Ridgetop Trail as you loop back around the swimming lagoon. 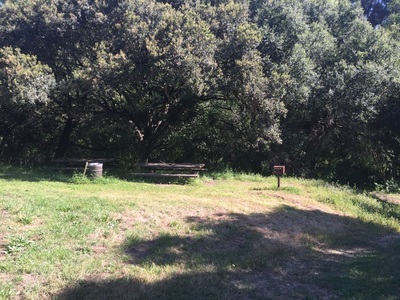 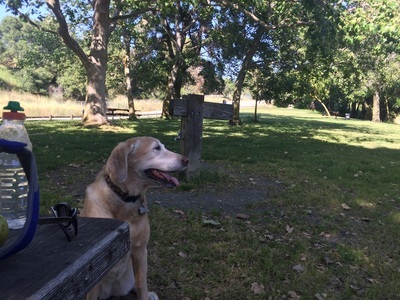 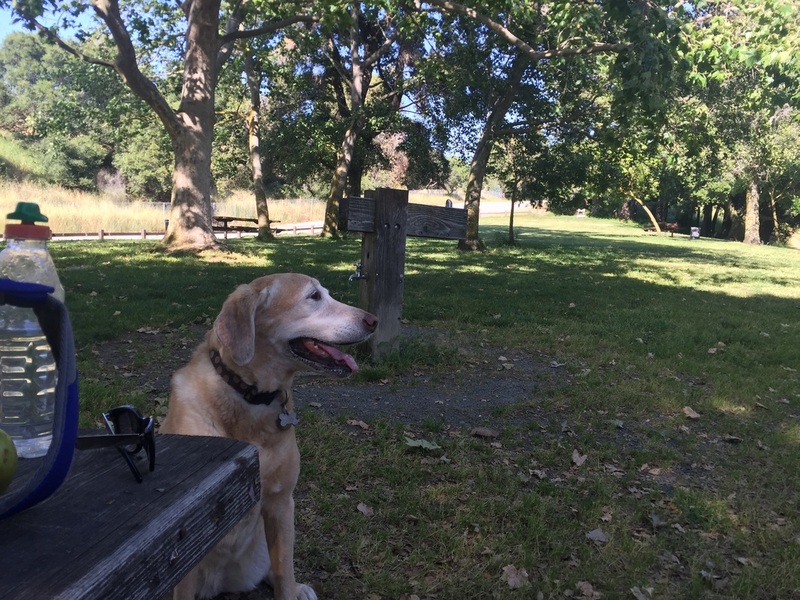 We found water faucets at the Twilight Picnic Area, and the Ridgetop Trail picnic area.